2X - £56.99 Only 5 left! Some monsters are just natural born scarers, while others have to spend years at Monsters University to build their scaring skills. And then there are some monsters, like James "Sulley" Sullivan, who are natural scarers but go to school anyway, and end up becoming legends! But for non-monsters, getting a scaring career off the ground can be hard. 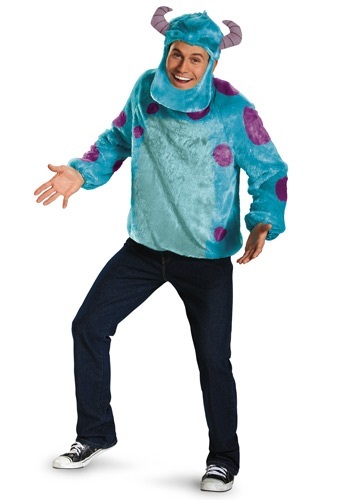 Luckily, with this licensed Plus Size Deluxe Sulley Costume, transforming into a legendary scarer couldn't be easier! You've seen how good this big blue fella is at getting the screams in the hit Disney movies Monsters Inc and Monsters University, so you know you're modeling yourself after the best in the business. Just think of all the high quality scares you'll be able to pull off in the real world, instead of wasting all those prime scaring years in a classroom. But we still recommend taking a look at a couple books and training manuals, just to get a little background on scare-theory and some of the more advanced techniques. And whatever you do, never leave a door between the human and monster worlds open! With a little practice and this fearsome deluxe costume, you'll make a name for yourself in the scaring industry in no time! The shirt and matching hood are covered in 100% spotted blue monster faux fur, with a tail attached to the shirt, and fierce looking horns and a beard on the hood. Team up with a buddy in a Mike Wazowski costume to form an unstoppable scaring duo!